Imagine not having to worry about unsightly hair when you are heading to the beach or outdoors. We all struggle with unwanted hair. Lasers can safely remove hair on most body parts. Heat generated by the laser damages the hair follicle and inhibits hair growth. Each follicle is in a dynamic state and therefore you must have a series of treatments. Keeping your laser treatment appointments to a 4-6 week cycle is critical to the success of your treatments. Before your treatment, our esthetician will create a treatment plan to achieve your goals for hair removal. What areas are most popular areas for treatment? The most common treatment for women continues to be the leg, armpit, face and bikini line areas. Neck, upper arms, back and shoulders are the most popular areas for laser hair removal on men. How many laser hair treatments will I need? The number of treatments required for your laser hair removal will depend on the amount of hair, the coarseness, your skin type, the area treated and hormonal shifts that you might be experiencing. Test spots may be done to evaluate your skin response. In most cases, we recommend a series of 6-8 treatments spaced about one month apart. After the series of treatments, any regrowth areas can be addressed with periodic treatments. At your consultation, our esthetician will create a plan for your specific needs. Our esthetician will examine the areas to be treated paying particular attention to your skin color, density, coarseness, and any hormonal shifts you may be experiencing. You may be asked to stop medications that cause photosensitivity and to consult with your prescribing physician. Do not use Accutane 6 months prior or Retin-A products for at least 2 weeks before treatment. Avoid waxing, plucking, depilatory creams and tanning one month before treatment. We also recommend that you not tan during the entire course of treatment and for six weeks after. Artificial tanning products must be discontinued two weeks prior to treatment. Your goals and expectations will be discussed thoroughly at your consultation. Feel free to bring a list of questions. We love an informed patient. Our esthetician will let you know what to expect before, during and after your procedure and answer all of your questions. This procedure is quick and simple and is performed with your comfort in mind. A topical numbing cream can be used to numb the area, but in most cases is not needed. You will be given protective eye-wear. Patients describe a light prickling sensation although the area being treated may affect your sensitivity. Test spots may be done to evaluate your skin response. Afterwards, you will most likely experience redness and maybe even a little stinging. This generally subsides in about two to four hours. You will also notice that the hair remains in your skin after the procedure. These hairs will fall out on their own overtime. 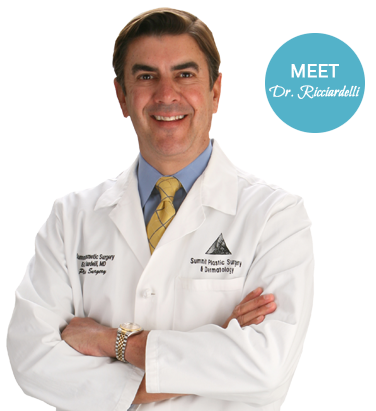 Why choose Summit Plastic Surgery & Dermatology to have laser treatment? It’s about confidence: confidence in the person performing your laser treatment, confidence that your wishes and individual concerns will be heard, and confidence you will get the results you want. We have the experience and reputation that with a known track record in the area.